Take an honest look at your physical health and ask yourself how fit and healthy you really feel. What about your energy levels, stress levels, sleep patterns? Are you physically active and do you eat healthily? Are there any medical issues that need addressing? Feeling good physically is a key indicator of your overall happiness. While we can’t all be brain surgeons or rocket scientists, we can all aim to be fulfilled in our chosen career paths. Are you good at what you do and do you feel a sense of job satisfaction? Do you feel valued by your employer for the contribution that you make in the workplace? Take a look at your family relationships and wider social network. Do you spend quality time with your loved ones? Do you feel accepted just as you are as part of the wider family or are there any issues? Are you close to those around you and feel connected to your community? We all need positive friendships and a sense of belonging. Take a look at your immediate surroundings – is there clutter at home, mess on your desk or chaos in your car? It may be a reflection of what goes on inside of you. Make sure there is space in your life for new thoughts and things that serve you and get rid of old (mental and actual) junk. We don’t all have the resources of the young Duke of Westminster’s £9.5 billion fortune, but we can all ensure that we live within our means. Are you in control of your finances, including making provisions for the future and for those closest to you? Joy and happiness go together like strawberries and cream, but as we grow older and life takes over, it’s easy to forget how to have fun. How often do you connect with your inner child? Do you laugh and play, dream and dare just because it makes you feel alive? Life is more than a series of chores, so think about the activities that feed your soul. Whether you love creative pursuits such as singing or painting, you like the intellectual stimulation of learning a new language or playing chess, or you take an active interest in current affairs, it’s important to be true to yourself. Do you feel connected to a higher power or an inner optimism to keep you grounded? Your mental wellbeing will increase if you can stay curious and engaged with the world around you. How happy are you with your current relationship status? Are you quite happy being single, looking for your soulmate or feeling secure as part of a loving and supportive couple with shared values? 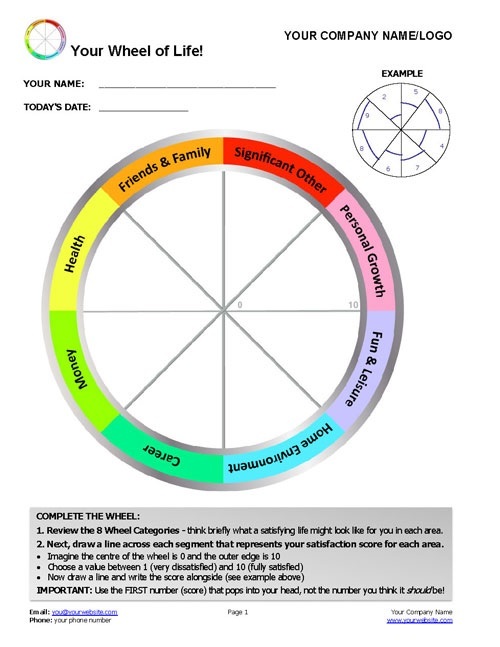 Mark each of the 8 segment of your overall happiness ‘pie’ on a scale of 1 to 10 to create an individual map that is a visual representation of your current state of personal contentment. Now take a long look at the shape of the results. Are you happy with the overall amount of happiness in your life? Which segments are strongest and do you appreciate what you’ve got in these areas? What about areas for improvement? Armed with a clear picture, you’re now in a really good place to devise a positive plan of action.